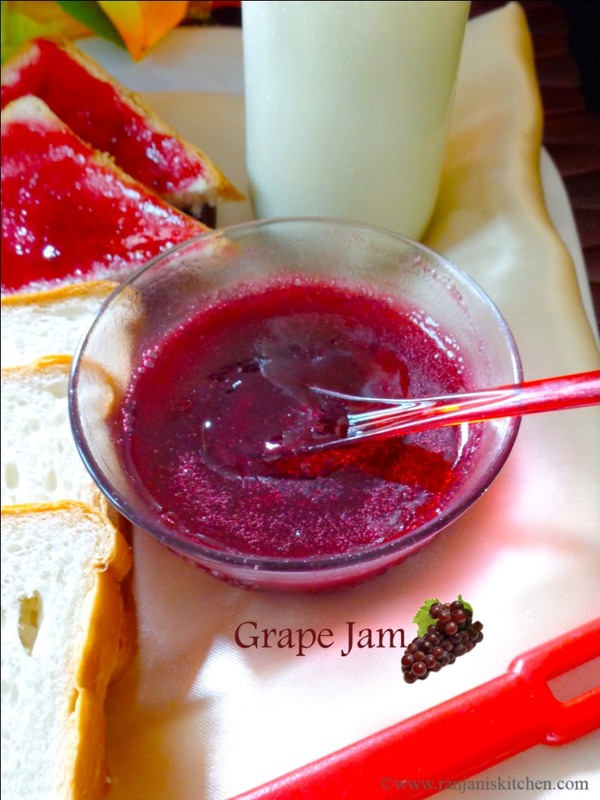 Grape Jam – well go with breads and fill our breakfast plans too. 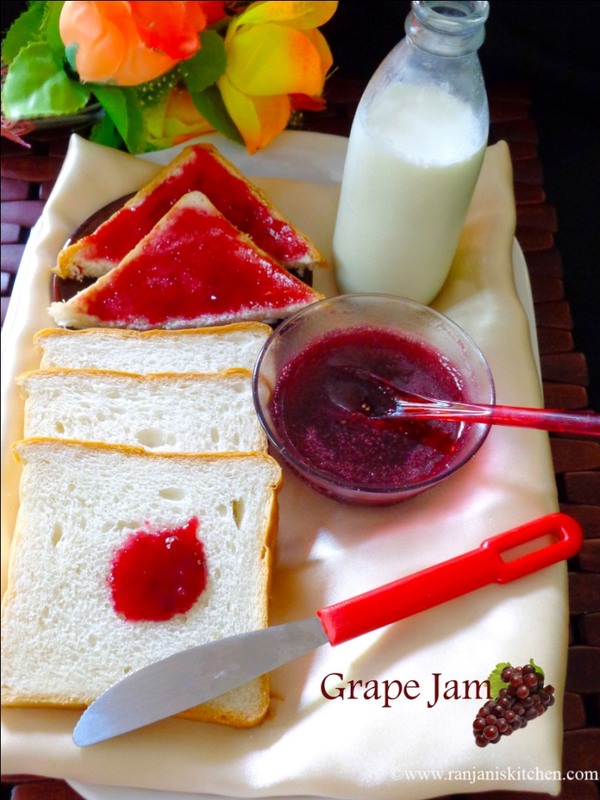 We can make good and tasty jams in home itself and get out these store bought preservatives. From all fruits we can make jams. Now in grapes, yes its seasonal now. So why not, let’s go for the preparation. Soak grapes in normal water for 30 mins.Rinse well in tap water for 3 to 4 times to completely remove the pesticides. In sauce pan, add grapes, lemon juice and grated ginger. Place it in stove top and cook till the juice and skin completely separates. Drain this mixture using a drainer and completely discard the seeds and skin. Now pour this juice in a wide pan or tawa and start heating it. Once it starts boiling, add sugar and mix well. After the sugar gets dissolved, stir till it becomes slightly thick. Do not stir long, we can turn off the flame while the jam is semi runny consistency as it becomes thicker once it cools down. If you find difficulty to identify the jam consistency, place one silver spoon in freezer for two mins. Then take a small portion of jam and place it in freezer for two mins.If it becomes thick and breaking, your jam is ready and you can turn off the flame. Store in airtight container or sterilized bottle while the jam is hot itself.If the jam becomes thick, its not easy to pour the jam to bottle. Adjust the sugar as per taste. Grapes have little tangy in nature. So add little lemon juice as it will spoil the jam taste. This is seems delicious finger licking jam. 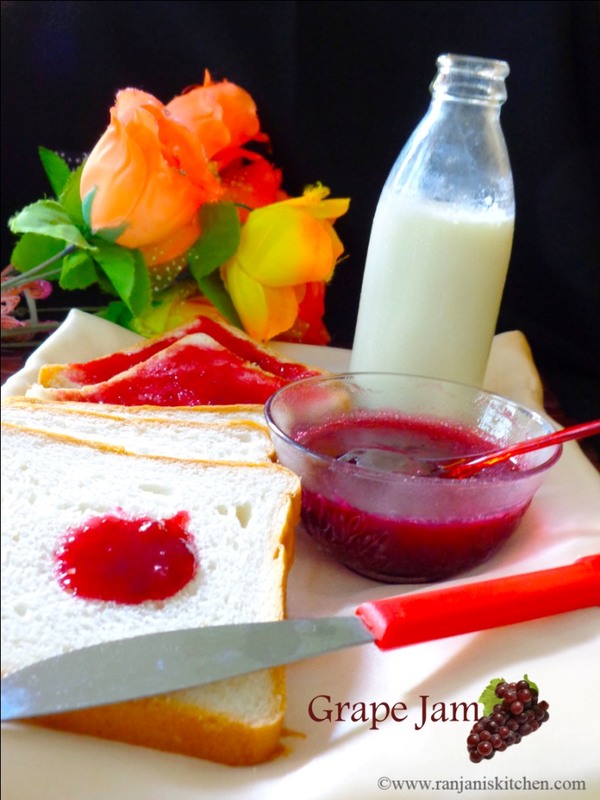 Lovely colour and click…Jam is looking so yummy..
delicious and simple to make. Healthy and yummy jam. Appetizing.